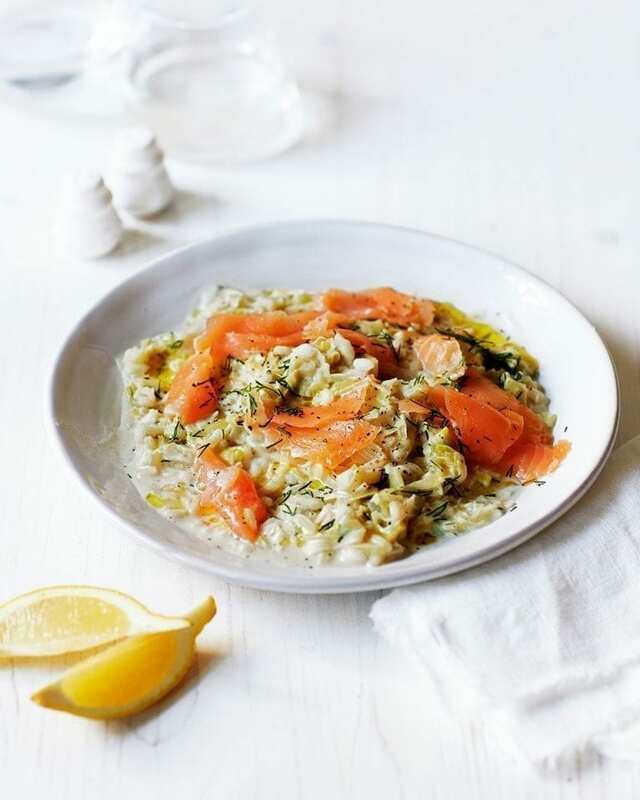 No need to slave away over risotto – this recipe doesn’t require any stirring and is finished off in the oven. Ready in an hour this seafood dish can be enjoyed any night of the week. Heat the oven to 180˚C/160˚C fan/gas 4. In a large flameproof casserole (one that has a lid), heat a glug of oil and add the leeks (see tip). Fry for 5 minutes on a medium heat until starting to brown. Add the garlic and rice, then cook for 2-3 minutes until the rice is translucent. Pour in the stock and 600ml of the milk, put the lid on and bake for 35-40 minutes until the rice is tender and has swelled. Warm the remaining milk. Remove the casserole form the oven – it will look like the milk has split, but don’t worry, it will come back together. Stir in the remaining milk, crème fraîche and half the lemon juice. Taste and add more lemon juice, if you like. Stir in the salmon and dill, then season. For a vegetarian dish, you could fry 200g mushrooms with the leeks for 3-4 minutes more (you will need a little extra oil).